During the 2005/6 winter we were buried under a veritable avalanche of hyperbole as the mainstream press blamed out of control freeriders for the worst season of avalanche fatalities since 1970. There were suggestions that off-piste skiing was about to be banned with even the (now) French President taking an interest in the bad boys of the backcountry. 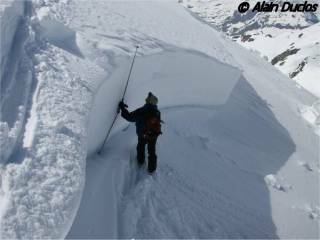 Slab avalanche in the Maurienne - April 2007 - photo Alain Duclos. What a difference a year makes; last season during the winter period just 18 people were killed by avalanches with a further two deaths during the summer and culminating in a rare and thankfully not to serious autumn slide in the Belledonne on the 29th of September. The figures were the lowest since 1989, another winter with poor snow cover. The press and the army of armchair web commentators have moved onto other subjects but once again we bring you our detailed analysis of what happened, why and where. The big trend was a halt to the rise in off-piste skiing fatalities which cannot be entirely explained by the visitor numbers to ski resorts and snow conditions with ski touring fatalities increasing as a percentage, something we predicted last year. The overall figure for ski touring deaths was the same as the 17 year average, surprising given the conditions and the lack of outings at the start and end of the season (see graphics in PDF link). The winter was very brief, from February to mid-March with stable spring skiing conditions over much of the rest of the season. Fatal avalanche accidents were largely confined to the 48 hours during and following fresh snowfall. An abridged version of this article was published in the autumn ediiton of The Avalanche Review, the journal of the American Avalanche Association. Avalanche Analysis 2007 PDF - 268 KB. The best news was the decrease in the number of incidents. This has to be attributed to the lack of snow and the lack of visitors over the last season. The worst news was the calibre of those caught in the avalanches. Very experienced skiers and tourers. The pattern shows that these accidents occured around the dates of snow fall and despite apparent precautions. Some information from the ANENA’s magazine Neige et Avalanche (Oct 2007 - ISSN - see the ANENA’s site if you want to subscribe). The ANENA were informed of 81 avalanche incidents, 54 accidents with 16 accidents involving fatalities with 20 deaths (same as our figures). 90% of the victims were male, slightly above the long term average. The average age was 37 although if you break this down to ski touring the age is 39 and for off-piste 29. 6 of the victims were non-French, which is close to the 28% average and a reason why we take avalanche information so seriously. Three of the victims were pros, there were the two ski instructors from Areches and a Swiss high mountain guide (see PisteHors report). Of the French victims 20% lived in the mountains, 20% in the valleys and 15% in the foothills. These are obviously the people who can ski the most but it also shows that living in proximity to the mountains doesn’t necessarily give you any special wisdom. As is clear from the PisteHors report and confirmed in detail by the ANENA ski tourers tend to be better equipped. None of the off-piste or climbing victims had basic safety gear of avalanche beacon, probe or shovel. Once again we see that an Avalanche Beacon is not a silver bullet but more a joker. Only 3 from 10 victims who were rescued thanks to their beacon survived. 9 victims were recovered due to surface indications, 5 survived (here we can see that the ABS airbag and possibly the avalanche ball are useful tools). All 4 victims found by rescue dogs were dead. Looking in detail, 33 people were completely buried by avalanches last year. Time is crucial. All 6 of those rescued within 15 minutes survived but the figures drop rapidly afterwards. 8 of the 12 victims buried for 15 to 45 minutes died and all 10 victims buried more than 90 minutes. This ties in with how people were rescued. 6 out of 11 victims that were rescued by companions survived. The figure falls to 5 from 14 where the rescue services were involved (time to get to the scene, locate victims etc is crucial). There is obviously a lot more detail in the ANENA report and we encourage anyone with a serious interest in avalanches to subscribe to their journal (in French).